If you’re worried about the negative impact U.S. Department of Education Secretary Betsy DeVos will have on K-12 public schools, you should also pay attention to what she’s doing to higher education. Fortunately, people who have the most at stake – students who aspire to attend college or who have attended at least some higher education and have incurred loan burdens because of that – already have a wary eye on DeVos, and they’re planning to counter whatever she and President Trump do with a renewed push for free higher education. But unlike efforts by the Obama Administration to take action at the federal level, some student activists are targeting states too. One such group is Student Action, a project of People’s Action, a national network of grassroots, progressive organizations that work together to advance democracy and a racial, gender, and economic justice agenda. 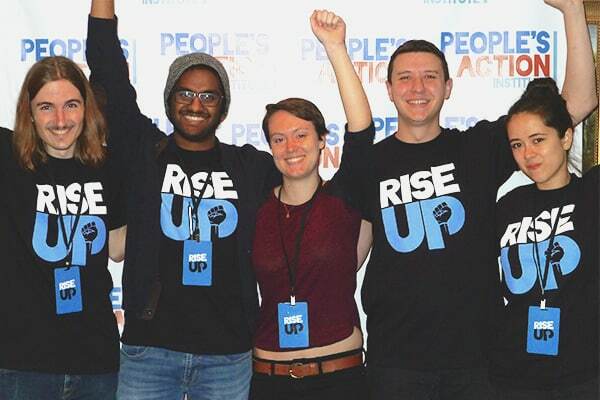 Recently, staff and volunteers of Student Action from across the country met at the founding convention of People’s Action in Washington, D.C., to share their struggles with college debt burdens and kick off their campaign to plan the organization’s push for free higher education. In addition to taking on DeVos directly, student activists at the meeting spoke of going around her to address root causes that are driving the college debt crisis in the states. DeVos recently drew the attention of state attorney’s general in the Democratic party who rebuked her for loosening requirements the Obama administration had placed on college loan servicing companies to ensure student loan holders understand what they owe and how they can pay off their debts. DeVos’s action follows other concerning developments in how her department may handle college student loan debt. DeVos’s actions to loosen regulations on college student loans come at a time when students need the support and protection of the federal government the most. As the Wall Street Journal reports, “State funding for higher education continues to fall” nationwide, which puts funding for colleges and universities more on the backs of students. A recent analysis by the Brookings Institute finds, as state direct aid to institutions of higher education has “stagnated,” students have come to rely more on financial aid from the federal government to cover the costs of tuition, books, and other expenses. In an extreme example, Governor Suzana Martinez of New Mexico recently vetoed all state funding for higher education in her state. Caught between states refusing to fund higher ed and federal loan programs that, under DeVos, are increasingly likely to exploit students needing college loans, Student Action is proposing to attack the root cause of upward spiraling tuition fees by pushing for free higher education at all two- and four-year, public-funded institutions. At their campaign kick-off in D.C., Student Action staff and volunteers from 12 states shared personal stories of their struggles with college debt burdens and their belief in education as a basic human right. Student activists spoke of having to take on huge amounts of debt burden – many with tens of thousands of dollars in loans – to pursue their education, so they can attain careers and achieve life aspirations. Participants at the meeting pointed to a potential early win in Illinois, where an effort launched late last year would make Illinois community colleges and public universities free for in-state students. A large contingent from Illinois who were at the meeting talked about how they are mobilizing college campuses to get behind the effort. Their advocacy will join with other progressive organizations in the state who plan to walk from Chicago to the state capital in Springfield later this month to press for free public higher education, among other demands. Others at the meeting criticized recent tuition-free college plans, like the one recently promoted by New York Governor Andrew Cuomo, that are filled with so many exemptions and caveats that substantial numbers of students, particularly the ones most in need, can’t qualify. Instead, Students Action will press for programs that are open to all students, even those who are undocumented or aren’t able to go full time. Other aspects of what Student Action wants in a plan for free higher education are likely to remain general for now, with policy details looking different in different states and demands driven by grassroots advocates rather than a top-down plan pushed by the organization. But the goal is to see some form of free higher education winning in some states within five years. “We can’t afford to wait out Trump,” one participant said.